For the past week, I’ve struggled in finding the right words and the right sequence of concepts to convey the thoughts I want to share in the most clear and concise manner possible. So like the rest of this series of entries, I’ll just go one thought at a time, then piece them all together in the proper sequence later on. The Thinker is permanent and considered to be real, but Its Thoughts are impermanent and considered to be “unreal.” In other words, thoughts come and go, but the mind thinking them always remains. All of the imaginings of The Thinker are projected as forms in the mental space of Eternal Mind, so all things, including our physical universe, can be said to be “illusion” because they have no real existence beyond being thoughts. This also includes the forms we call our souls and our incarnations, so both the soul form and the body form you currently inhabit are illusion / not real. All forms manifest according to definitions, so anything that can be defined is a form. If you take a moment to describe the electronic device by which you are reading these words, including its physical dimensions, its materials, its color, its functions, its configuration, et cetera, you are back-engineering its definitions. Eternal Mind is projecting its existence according to those definitions you’re describing. Now if you take a moment to describe your own body, you’ll realize that it can be defined, so it is a form. And if you take a moment to describe your soul, including the things that make it different from all the other souls, you’ll realize that it too can be defined, so it too is a form. All forms have a beginning point and an end point, with the beginning point being the moment consciousness focuses upon them, and the ending point being the moment consciousness finally casts them aside. For example, in the case of the human body you are currently experiencing, it is projected by the consciousness that creates this reality, with its beginning point being the moment of “conception,” and its end point occurring when posthumous decomposition finally renders it to dust. After that, it exists only as a memory. The soul form is a little different, though. Its definitions do not provide for aging, degradation, death and decomposition like those of your body form. So when Source Consciousness sets it aside, it is stored in memory in usable form and can be reinhabited. You can think of your soul as a telescope with a lens that is unique in all Creation. Source looks through it to see Creation in an entirely unique way, then sets it aside sometimes until it picks it up again. So when your soul is set aside, do you die? Of course not, you simply realize that you are not the soul through which you were viewing Creation; you are, in fact, Source Consciousness, and the concept of you and I was just an idea you were exploring. You are One, and you experience being many through soul forms. 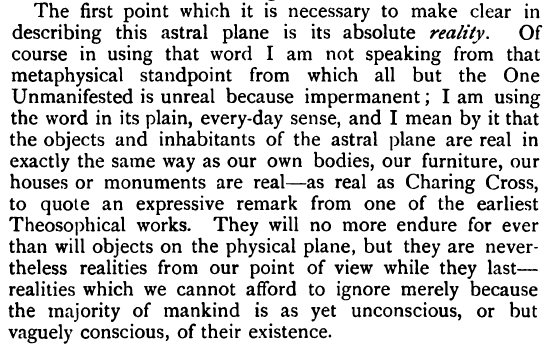 Moving on, another point in the book passage that’s worth addressing is its claim that the astral world and its forms are just as real as the physical world and its forms. Given that both the astral and physical are mere thoughts within Eternal Mind, this is true. But there is an important difference between the two worlds that must be noted: we humans can create objects in the astral world through thought, but we cannot do the same in the physical world. In the physical world, we can work only with the objects that are already here through the application of physical effort; we cannot create objects out of nothing. Our inability to conjure physical objects into existence is a pretty good indicator that the physical world isn’t the product of OUR minds, but of another level of consciousness. And the fact that we CAN conjure astral objects into existence is a pretty good indicator that the astral world IS the product of our minds. Some magician-types may claim that they can conjure physical objects out of thin air, but this is merely a trick of perception caused by a breaching of the barrier between the conscious and subconscious minds. In such cases, the effected minds aren’t seeing a real physical object being created; they are merely perceiving an astral overlay being projected upon the physical world. To understand what I mean by this, take a moment to look at the floor and imagine a red book lying upon it. By imagining the red book, you are creating it in the astral world, but since you are viewing the floor through your conscious mind, you can see that your thought hasn’t really created a physical book there. But if I were to hypnotize you and suggest that the red book was really there, you would see it just as clearly as the real physical floor. By using hypnosis to compromise the normal function of your mind, I’d be causing you to see the astral book overlaid upon the physical floor, but I wouldn’t actually be creating a real physical book. Other people in the room whose minds weren’t hacked would see that there is no book there. Let us now proceed to the final point from the passage: the “majority of mankind” being “yet unconscious, or but vaguely conscious” of the Astral Plane. Because of our general lack of awareness of the subconscious mental space and how it functions, most of us are unaware that we create within it, so our creations are all over the place. Resultantly, our collective subconscious has accumulated a vast grab bag of diverse and disorganized forms and realities. There is no real order to the Astral Plane, but the illusion of order can be created when two or more minds synchronize their expectations about it. This is exactly what occultists like the Theosophists have done, and we’ll explore this concept of imagined / imposed order as we go deeper into the book. On a somewhat related note, I’d like to clarify my reasons for taking you on a tour of this book. I’m not doing it to promote Leadbeater or Theosophy; I’m doing it because this book offers a good overview of the Astral Plane from the perspective of the occultists. And after we’re done looking at it, we’ll be exploring material from other ideological groups – none of which I’m trying to promote. I’m doing this survey in order to challenge the conventional wisdom about the Astral Plane and to suggest that a fundamental misunderstanding of it exists in the public mind, and there is no more powerful a way to point out this misunderstanding than to use the very words of those who wittingly or unwittingly promote it. In the next passage we examine, we’ll see where the book starts to jump the tracks. This entry was posted in Spiritual Matters on March 7, 2017 by kenneth.